United States Army Special Forces, Thailand, was originally organized as The Reactivated Company D (Augmented), 1st Special Forces Group (Airborne), in 1966. In October of that year, after intensive pre-mission training, the unit deployed to Thailand. An SFOB was initially established at Camp Pawai, Lopburi, Thailand. At this time, major training camps were established at Nam Pung Dam, Nong Takoo and Ban Kachong. On 15th April 1967, the unit was redesigned 46th Special Forces Company (Airborne), 1st Special Forces. The organization no longer possessed the lineage of its previous designation but shares the lineage and honors of the parent regiment, The 1st Special Forces. In December 1967, the headquarters moved from Camp Pawai to the home of The Royal Thai Army Special Warfare Center at Fort Narai, in Lopburi. 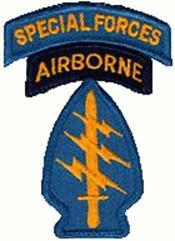 On 1st April 1970, The 46th Special Forces Company (Airborne), 1st Special Forces was inactivated. The unit was reactivated as United States Army Special Forces, Thailand. 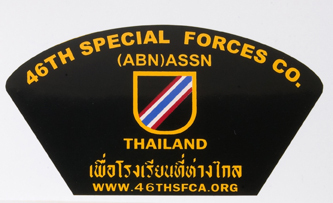 Many diversified missions have been levied upon United States Army Special Forces, Thailand, with the emphasis placed on counterinsurgency training. Initially, the unit was tasked with training selected infantry units of The Royal Thai Army prior to their deployment to Northeastern and Southern Thailand. Close co-ordination with Thai armed forces in formulating training programs, to include counterinsurgency and staff training for the Royal Thai Marine Corps, battalion and company level training for The Royal Thai Army, specialized courses for The Royal Thai Army Special Forces and airborne battalion personnel, ranger training and border patrol police courses were areas affected. During 1967, selected personnel of The 46th Special Forces Company (Airborne), 1st Special Forces, provided The Royal Thai Army Volunteer Regiment (Queen's Cobra) with training in preparation for deployment to The Republic of Vietnam. As time passed, additional programs were added to original missions to encompass the training of paramilitary and police organizations such as The Volunteer Defense Corps/Mobile Reserve Platoons, National Police and Police Aerial Reinforcement Units (PARU), to mention a few.